My name is Jeremy Davies and I have resided in Calgary Alberta (Canada) since 1996. I have been fly fishing since 1990 and started casting little black nymphs for goldeye on the North Saskatchewan River in Edmonton Alberta. I later began to take notice of the great foothills streams southwest of Edmonton such as Stauffer, Prairie, and Shunda Creeks. 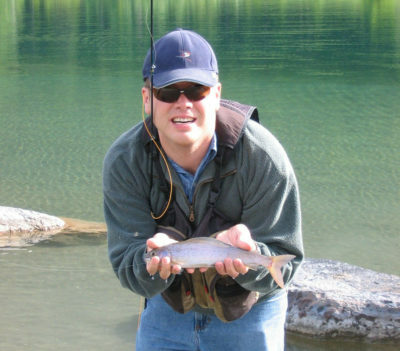 All these Creeks have great fishing for brown and brook trout in a wide range of sizes. In fall 1995 I became greatly inspired by catching a 23 inch brown trout on Stauffer Creek, one of the toughest spring creeks in Canada. I seriously started tying flies in winter 1994 and spent countless hours at the vice from that time on. I no longer had to pay $2.00 for a fly and “bum” patterns from my fishing companions. In fall 1996, I moved to Calgary and the world famous Bow River. 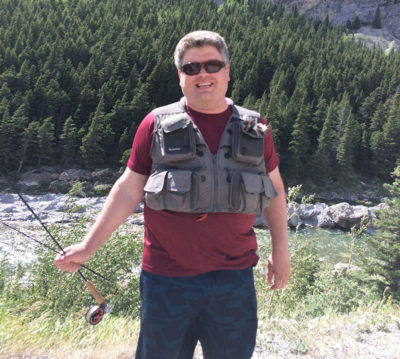 I was ecstatic because I feel that the Bow is possibly the highest quality trout stream in North America with the largest number of rainbow and brown trout that measure 20 inches plus. 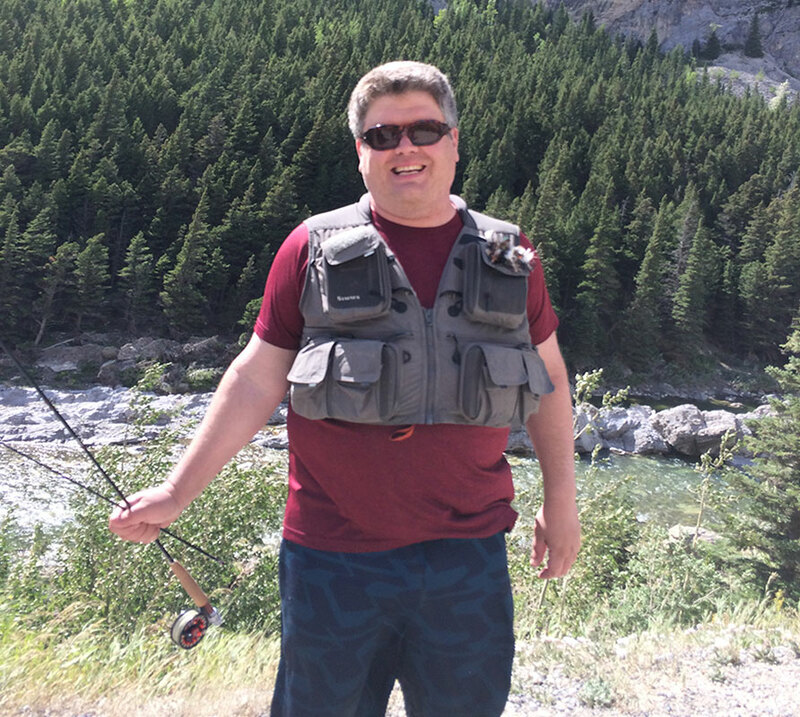 It was my move to Calgary and its phenomenal fishing that accelerated my skills as a fly tier. 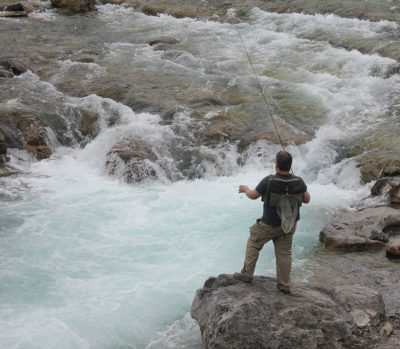 I learned tricks of the trade from many of Canada’s best trout tiers over the years and became a half decent tier myself. In 1998, I developed a popular pattern called the “Evil Weevil” which has become one of the most popular, patterns in the province. In fall 1998, I started tying two flies commercially for Calgary area fly shops: The Evil Weevil and the Tigerstone. Initially, I sold flies to fund my Masters of Education attained in 2005, but now I find it to be a relaxing way to spend my evenings and weekends. I have now expanded the number of fly shops that I tie for and produce over 20 different flies commercially. 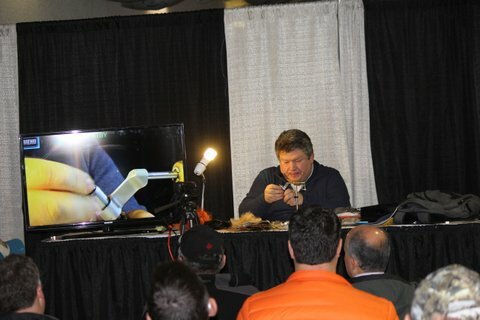 I am the fly tying editor for Fly Fusion Magazine and I still tie flies commercially for a several Alberta fly shops and commercial clients, but I have scaled my production down to about 17,000 to 20,000 flies to keep up with other work demands. I continue to design and develop several new fly patterns for both myself and to fulfill my role as fly designer at Montana Fly Company out of Columbia Falls, MT. To date I have developed over 100 unique and effective patterns that I urge all anglers who view my site to tie and try. I plan on continuing to develop my website with the hope of providing a variety of unique and useful products and information to fly anglers everywhere.